Why are high-efficiency water heaters important? What is the Energy Star product? Can it really save you money? Energy efficient water heaters, high-efficiency systems, and Energy Star appliances are all the terms used when talking about the heating products that have a low heat loss and using over 80% of its energy for heating. They utilize the new technology and are designed to save energy, resources, and money, also reduce the greenhouse emission and provide better environmental protection, then the low-efficient models. If you are using natural gas for water heating, you can find many manufacturers and models that comply with the Energy Star requirements – just look for the units with the energy factor of 0.9 and over. They are known as the Energy Star water heaters. If using the electricity for heating, the only option you have are the electric heat pumps, such as this Voltex from AO Smith. If you consider buying a new unit or replacing the old one, take advantage of this improved technology, energy efficient or high-efficiency water heaters are a good and cost-effective replacement option for your home. The most energy efficient water heaters available are gas-fired with the condensing technology. You can buy either tank-type or tankless. Water heaters that are considered as energy efficient are designed to reduce the energy loss from its tanks by having the higher levels of insulation around the tank, one-way valves where pipes connect to the tank (heat traps) or special helical heat exchanger as found in Polaris. These models, with the efficiency of 90% and higher can substantially reduce the standby heat loss, but, are more expensive. Condensing and "near-condensing" gas water heaters or boilers save much more energy when compared to traditional models, and their energy efficiency is over 90%. Manufacturers of condensing heating units like Vaillant, Baxi, Junkers, Viessmann are popular in Europe, but condensing boilers are fairly new products in North America. 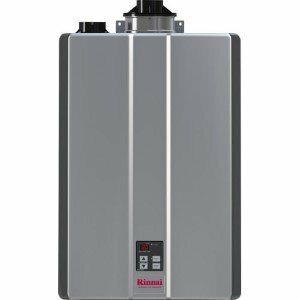 You can find them among Noritz, Rinnai, and Paloma tankless water heaters while AO Smith and Polaris among tank-type heaters. If gas-powered, energy efficient water heater interest you, consider buying a sealed combustion unit, also known as direct vented or power vented. What does the sealed combustion mean? The outside fresh air is brought in, directly to the water heater while exhaust gases are vented outside, keeping combustion independent from the inside air. This is done through the special venting kit, which usually comes separate from the heater. Tip: Consider insulating hot water delivery pipes to prevent heat loss and energy waste, especially in the area where pipes run through the unheated portions of your home. Note: "ENERGY STAR was developed by the US Environmental Protection Agency (EPA) and the US Department of Energy to reduce energy use and air pollution by labeling energy-efficient, cost-saving products used in homes and offices." (source energystar.gov). Gas-powered energy efficient water heater from the tank type group utilizes the same technology as the standard type: water in glass-lined steel tank is heated by the burner that is located at the bottom of the tank. High efficiency (HE) water heaters have an extra quality and thicker tank insulation for better heat retention and reduced standby heat loss. Standby heat loss is a loss of heat through the walls of the tank, representing nothing more than energy waste. Tanks are built with the heat traps, where water flows into the tank but prevent unwanted flow of hot water out of the tank; and with the high-efficiency burners that transfer more heat to the water. As we said before, to increase the efficiency further, manufacturers may add a power vent to accelerate venting of the combustion gases. Flue baffle and flue damper have improved control, reducing the heat loss through the flue vent. They are using electronic ignition, not a pilot light that was wasting gas when there was no need for heating. Energy Star water heaters use at least 5% less energy than standard models. If you have decided to buy an energy efficient water heater, either buying through an online store, retailers like Home Depot, Sears, Lowe's, or contractors, look for the blue tag on the unit and familiar logo ENERGY STAR (see the picture). Check also for rebates and government tax credits. If you have a favorite brand, like Rinnai, Rheem, Noritz, Takagi, Bosch, AO Smith... find out which qualified Energy Star water heaters are available on the market. See the prices here. 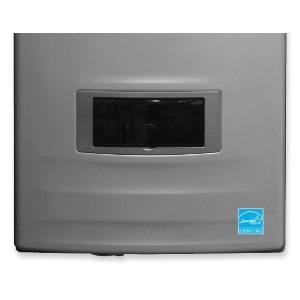 Do you prefer tankless heaters or tank type? Decide about the size/capacity you need, is your preference a 40 or 50-gallon tank type or 2-bathroom tankless heater. If you are planning to replace the old heating unit, and you were happy with the capacity, then use the same tank size. If you don't know what the size is, check out the manual or find the sticker on the unit. The First Hour Rating is another critical factor when selecting the best energy efficient water heater; it shows how much hot water the unit can deliver during a busy hour. It is especially important to have enough hot water during the peak hour; i.e., growing children, teenagers, when adding a shower, dishwasher or washing machine. Another important factor is the Energy Factor, EF. The recommendation is to buy a heater which has the highest EF if it is in your price range. 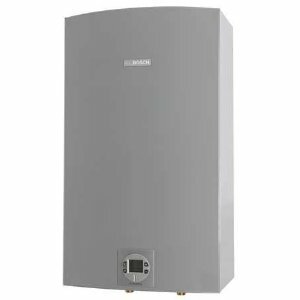 Gas-powered storage tank-type water heater should have the energy factor (EF) of 0.67 or higher, and the First Hour Rating at least 67 gallons per hour. 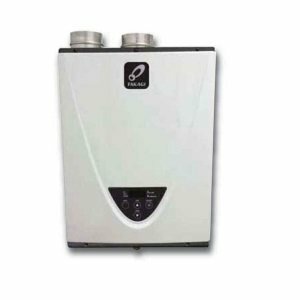 Gas tankless water heater requirement for EF is 0.82 or higher and 2.5 GPM water flow or higher - 109 F temperature rise or higher. Requirements for condensing gas storage heaters is; EF 0.80 or higher and the First Hour Rating 67 gallons per hour, minimum. The heat pump water heater should have EF of 2 or higher and the First Hour Rating 50 GPH or higher. Solar water heaters should have Net solar energy contribution equivalent to ≥ 7.0 GJ/year. See all the requirements here. Finally, collect several quotes from the contractors or retailers and make a wise decision about your energy efficient water heater. "If everyone in the U.S. purchasing a standard gas water heater this year, choose a qualified Energy Star model instead, we would prevent one billion pounds of carbon dioxide from entering the atmosphere, the equivalent of creating 132,000 acres of forest ." (source energystar.gov).